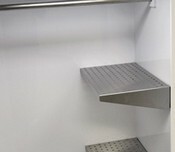 SecureDry™ evidence drying cabinets are designed to provide a secure and dedicated area for drying wet evidentiary items while creating a barrier to keep out the potential threat of cross contamination. The cabinet utilizes pre-filtration, HEPA and carbon filtration to minimize the potential for environmental cross contamination and employee exposure to putrid odors or biological material. SecureDry™ is constructed from rigid white polypropylene that is thermally fused in order to create a continuous chamber, eliminating structural cracks and crevices. 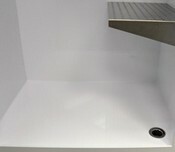 The elimination of cracks and crevices allows for ease of cleaning and maintenance between cases and minimizes the potential for bio-burden build-up. An optional timed 254 nanometer UV light is available for chamber irradiation, further reducing cross-contamination risk. Room air is pulled into SecureDry™ through electrostatically charged pre-filtration at "A". This pre-filtration is designed to remove gross particulate and fibers (potential cross-contamination). Once room air is inside SecureDry™, it circulates around the wet evidence at ″B″ before entering a three-stage filtration process. The exhaust air passes through an electrostatically charged pre-filter at ″C″. This pre-filter captures any trace evidence present in the airstream, and should be removed between cases for laboratory examination. 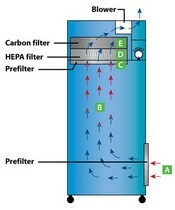 Air then passes into the HEPA filter at ″D″. The HEPA filter captures potentially harmful biological material. Air passes through the gas phase carbon filter at ″E″ before exiting the chamber. The gas phase carbon filter prevents putrid odors from escaping into the laboratory space.